Dallas Autos Direct has a wide selection of exceptional pre-owned vehicles to choose from, including this 2013 Land Rover Range Rover Sport. This Land Rover Range Rover Sport HSE LUX is an incredibly versatile vehicle that is a "must have" for any family. Put performance, safety, beauty, sophistication and all the right amenities into a car, and here it is! Now you can own luxury without the luxury price tag! This 4WD-equipped vehicle handles any condition on- or off-road with the sure footedness of a mountain goat. 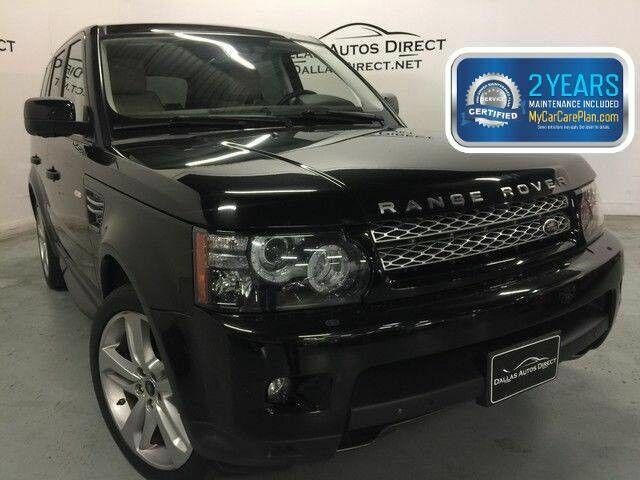 With unequaled traction and stability, you'll drive with confidence in any weather with this Santorini Black Metallic 2013 4WD Land Rover Range Rover Sport HSE LUX. A Land Rover with as few miles as this one is a rare find. This Range Rover Sport HSE LUX was gently driven and it shows. Added comfort with contemporary style is the leather interior to heighten the quality and craftsmanship for the Land Rover Range Rover Sport Enjoy the drive without worrying about directions thanks to the built-in navigation system. If you're looking for a one-of-a-kind automobile, look no further. Engineered with the latest in technology and features, this vehicle is an automobile lover's dream. Clean interior? How about flawless. This Land Rover Range Rover Sport looks like has never been used. Equipped with optional wheels. More information about the 2013 Land Rover Range Rover Sport: The Range Rover Sport is the smaller brother of the Range Rover. While the original Range Rover is meant to be the ultimate off-roader, the Sport is oriented more toward on-road performance, reflective of the way most people actually use their SUVs. A pair of very powerful V8 engine options and Land Rover's celebrated off-road differential programs means very little has been sacrificed, yet the Range Rover Sport costs $20,000 less than its larger sibling, and gains much in terms of practicality. Interesting features of this model are latest technology, interior of the highest luxury, and Proven, excellent off-road capabilities Finance available with applicable fees.